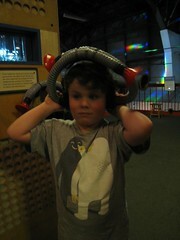 Two days ago, San Francisco's Exploratorium hosted an exploratory Autism/Aspergers Family Night. 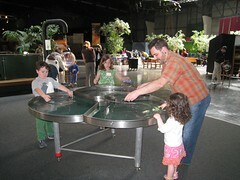 The goal was to help ascertain the needs of certain Exploratorium-adoring families who can have a hard time being *at* that wonderful science center, and how best to accommodate said families when the Exploratorium moves pierward in 2012. Admission was free. The event was fantastic. Leo and the girls frolicked. I was floored -- and so, so grateful. I've never seen a non-autism organization put so much effort into meeting the needs of my son and his friends. My faith in humanity has been restored. There are so few places we can go as a family where Leo will enjoy himself, and where we needn't worry about a scene if his enjoyment ceases. Hiking, swimming, the Monterey Bay Aquarium on a slow day, the Arboretum ... that about covers it. There are many places Leo tolerates, but few in which both he and his sisters get to have fun. At this event, our entire family got to have fun. Unbridled, rambunctious, kooky fun. Hours of it. This success didn't come without significant, almost herculean effort to accommodate Leo and his friends. The Exploratorium brought in Bryna Siegel and her UCSF Autism Clinic crew to plan, and to staff. (Side note: It was amusing to see Ms. Siegel instructing Mali on using an exhibit properly; autistic and defiant behaviors can both be handled with similar techniques.) Exploratorium staff also volunteered their time. As a very thoughtful bonus, dinner and snacks were provided, and they were mostly GFCF. Representatives from both Mariposa Baking Company and Acre Catering donated their time to serve the food, which was all super-healthy and delicious -- Seymour and I tucked in. Unfortuntely our picky boy only liked the toast wedges, but I always bring food for him so it was no problem. Fortunately and un-, they limited the number of attendees. I feel for the numerous families who had to be turned away, I really do -- especially because I know several of them. But limited attendance also meant a relatively mellow audioscape (they provided earplugs for the truly sensitive) and lots of personal space, and no typical Exploratorium crowds or noise -- so no overwhelm and resulting acting out. It was thrilling to see Leo running around, exploring, and investigating without us having to worry about him bumping into people or stomping on toddlers. My son's experience was made even easier by the planners, who understood that Leo and his friends are not all alike in their needs and interests, and planned three different pathways/walks: sensory-based, reading-based, and an organization-centric. Each path came with a map, each station on the path was marked with color-coded balloons. The staff gently encouraged but did not interfere, and the kids the interacted with exhibits in their own ways. 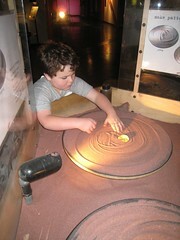 Leo, for instance, was as happy to play with sand wherever he found it, inside or outside the exhibits. Leo absolutely loved the Exploratorium, and so did his sisters. But we might never have risked a visit, had we not been given the gift of Autism Family Night. The staff said that it's not as busy in the late afternoons. We just might show up. Exploratorium staff, you have my sincere thanks and gratitude. Please say you'll do it again! This makes my heart sing! It also makes me really, really, REALLY miss the Bay Area! So glad you got a chance to go and had such a fantastic time. You *all* deserved it. It sure sounds like they had some really stellar planning, too. It's wonderful to hear about scenarios that work out and exceed expectations. If there is a documented model for planning and executing this event, it would be nice to see it expanded to other museums and attractions. Wow, I am so impressed with this. I wish our children's museum would try something like this. Bravo San Francisco!! Wow. I heart the Exploratorium (and had the opportunity to work there, many many summers ago). It is an amazing space that captures the reality of science. I'm probably the only one who regrets its move out of the palace of fine arts, but the fact that the leadership there often "gets it" makes me hopeful that the move won't loose the spirit. The place is not very sensory friendly, when crowded, and I think it is awesome that they put this event together. As Lauren suggests, it would be great to see someone put together the accommodations they made and make them available to others. It looks like it was a private event. How did you gain access to it? That is so wonderful that they put that event together. I hope they can do it regularly. I know how hard it is to go out as a family when one has such sensory issues. I usually refer to Kayla as "luggage" when we go to touristy places, because she just ends up hidden away in her stroller, sucking on her binky, with her MP3 player stuck to her ear.